Between November 12 and November 22, 2015, Democrats from around the world will discover, bid on, and win amazing prizes and opportunities during the 2015 Democrats Abroad Global Auction. But to make it a success, we need items donated by all our members, people like you. Check out the Auction site now to see what’s already been donated – and get some ideas about what you can donate. Vacation homes, language lessons, objets d’anything – all make great auction items. Best of all the proceeds go to Democrats Abroad. 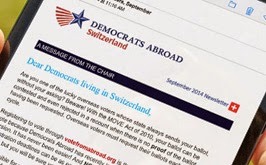 If your donation is bought when the auction goes live, you get listed as a Democrats Abroad Donor – and the proceeds go to our 2016 Get Out the Vote Campaign in Switzerland and around the globe – which is going to be crucial if we want to keep the White House and take back Congress next year. To take a look or make a donation, go to www.biddingforgood.com/DemsAbroad and get started. Any questions, just email Auction@democratsabroad.org.